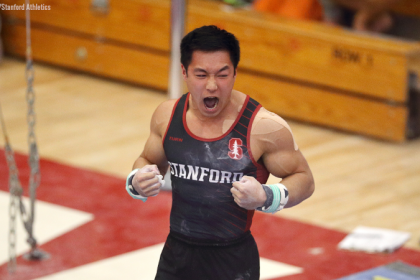 Are you looking to watch more men’s NCAA gym in 2019 but don’t know where to start? We have you covered with 10 routines that are can’t miss—from Stephen Nedoroscik’s flawless pommel routine to Alex Diab’s signature set on rings. His form is to-die-for and his twisting is as quick as a whip. 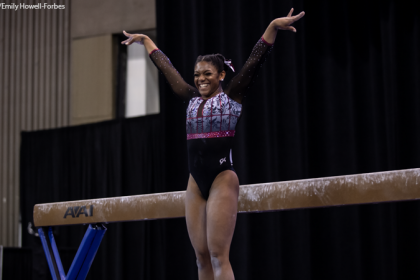 You haven’t seen a Yurchenko two and a half quite like this one—no, not even from Simone. Just trust us and check him out in 2019. Ugh, he’s just so great on horse. The difficulty is there, the swing is there, the form is there—plus, power of the glasses! Also can we talk about how he does one of my favorite skills on the event in the one-arm circle thing? Little Penev is in college now, which means we’re in for his toe point and twisting form for the next four years. Bring it on. When Styer took the floor at UIC’s Mixed Pairs, every man in that gym was screaming—and I mean screaming; I may have hearing damage. I knew I was in for something. Then he started tumbling: massive front double full, sky high double double, big double Arabian. His dismount? A full-in. The set just never ends. He unfortunately put his knees down on the dismount, but I am so excited to see what he’ll do in season. I unfortunately couldn’t find a video of his whole set, but you get the idea. The Canadian National Team member does precise, gorgeous gymnastics and could very easily become an international stalwart in the future if he uses his four years in Berkeley to build up difficulty and consistency. Guimaraes picked up U.S. junior national titles on floor and vault in an Oklahoma leotard this summer before the school year had even begun, and his gorgeous lines and great landing sense will make him a star. As only a freshman last year, Wiskus made a name for himself as one of the top all arounders in the NCAA. He placed second only to Yul Moldauer at the NCAA championships last spring and had the second highest all around RQS of the year (Alec Yoder held the No. 1 spot). He’s definitely one to watch this year to see how he continues to mature. 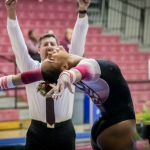 As only a sophomore last year, Zakutney tied for third on parallel bars at the national championships. Look for him to only improve in 2019 after coming back from the world championships in Doha. When Diab is working rings, not even a finger is out of place. He seriously looks as still as a statue during his strength moves. In his senior season, Diab will undoubtedly bring it on the event as he tries to defend his NCAA title, as well as four-peat as Big Ten champion. Moore has quietly become one of the NCAA’s best floor workers, and he’s only a sophomore. The reigning NCAA runner-up on the event makes a difficult routine look effortless with his quick twisting abilities for combination passes paired with the power for a well-executed double double. Watch for Moore in the anchor spot on floor for the Wolverines in 2019. There are so many vaults we’re looking forward to seeing in 2019. What are some of yours? Let us know in the comments below!